Altek has the capabilities and systems in place to ensure your project needs are met. Altek’s PVA6000 coating and dispensing system was custom made for our company with a 600x600mm work area. 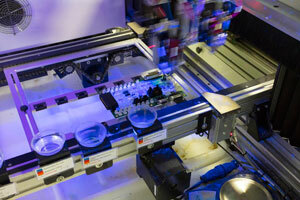 It is configured with two valves for acrylic conformal coatings and two for silicone conformal coatings. It includes a XYZ repeatability of ±25 microns and an encoder resolution of 5 microns at a maximum acceleration of 1g. A prominent highlight of this machine is the four-axis motion, featuring valve- tilt and rotating capabilities. The PVA IR2000 has a curing length of 1.2m and can reach a maximum panel temperature of 260°C. It presents a conveyor speed of 0.15m/min to 5.8m/min, a board/pallet width of 51mm to 457mm and a component clearance of 100mm top and bottom.